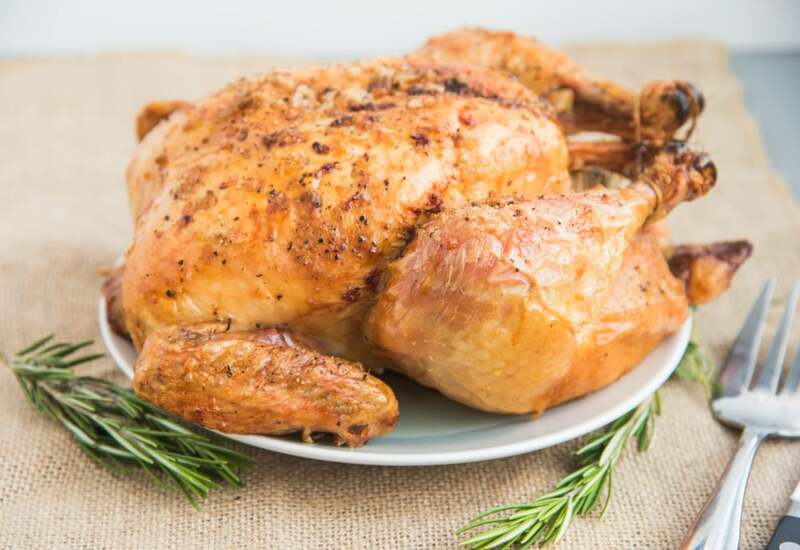 Take it back to basics with this simple roast chicken recipe that’s filled with aromatic herbs. You only need the addition of lemon, salt, and pepper and pop it in the oven, give yourself some time to make additional sides or simply enjoy the time to relax and take a break while the chicken roasts in the oven. Save the giblets and carcass to make an amazing broth by placing it in cold water and boiling it to a medium simmer for 2 hours with some mirepoix: carrots, celery, and onion! Per Serving: 220 calories; 14g fat; 3.6g carbohydrates; 21g protein; 66mg cholesterol; 100mg sodium. So simple, so juicy! So delicious. Crispy skin. Delicious. Did I mention delicious. The easiest, most perfect chicken recipe. BAM! so simple, so good - skin was delicious with a nice crispness to it, and the meat was juicy from the first cut. looking forward to the next opportunity to whip this up for some friends. So easy to make, fall off the bone, tender meat, and so much flavor with all the herbs and spices. I plan to make this weekly now. It's just me, so I use the chicken for my meal prep throughout the week. Such an easy recipe! I did also used red onion along with the garlic. Perfect, tender meat that's convenient to make ahead for busy weeknights.